Two top veteran sprinters who were quiet during 2018 will not be on the track for 2019, and whether they will be in 2020, an Olympic year, remains in question. 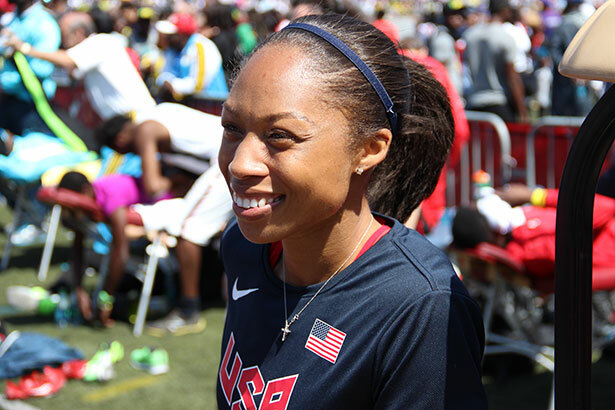 USA’s World and Olympic champion Allyson Felix (photo above) gave birth to daughter Camryn at 32 weeks on November 28 but made the birth public in the latter part of December. The 33-year-old had Camryn by emergency C-section. The six-time Olympic gold medalist told ESPN she planned to compete at the Tokyo Olympics in 2020 and would run with a new sense of purpose. “If I come back and I’m just not the same, if I can’t make a fifth Olympic team, I’m gonna know that I fought, that I was determined, and that I gave it my absolute all,” she said. On January 8, Felix’s arch-rival, Jamaica’s World and Olympic champion Veronica Campbell Brown (VCB), 36, surprised the track world when she announced via social media that she was pregnant. “We look forward to parenthood and all the joys and challenges that come with it. We pray for strength and wisdom to be the best parents possible,” she posted on Instagram. “At this moment, I am uncertain if I will return to competition, as the main focus is to welcome our baby, and to provide the best environment filled with love, warmth, and care,” VCB said. But while the two world-class sprinters are out, track enthusiasts will this season see Jamaica’s Shelly-Ann Fraser-Pryce, in full flight again. The 31-year-old double Olympic and triple world champion over the short sprints gave birth to her first child in August 2017, returned to competition in early May 2018 with an easy 100m win in Kingston. The following month, she finished second in the 100m (11.33secs) at the Cayman Island Invitational. In July, she clocked 10.98secs, a 2018 season best, to take the London Diamond League 100m. Last season, the pocket rocket, now mummy rocket, promised fans the greatest comeback in history. Fraser-Pryce opened her 2019 season on January 26 with a 7.21 victory over 60m in Kingston. Her 100m career-best 10.70 seconds registered in 2012 is the joint fourth-fastest time over the distance, along with her compatriot Elaine Thompson. “I’m feeling good and I’m excited about the upcoming season, and I’m putting in the work and trusting the process,” Fraser-Pyce said after the race in which she exploded from the block and pulled away comfortably.